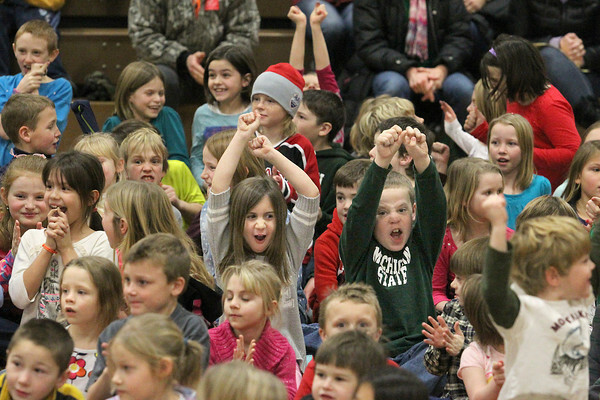 Westwoods Elementary second graders Teagan Nerg (cq), left, and Sawyer Vanderlinde (cq) react with their classmates after representatives from Bill Marsh Chrysler surprised the school with a check for $5,000 from Chrysler from the auto maker's Drive for the Kids program. The amount was a bonus to $3,530 the school earlier received for having 303 test drives of Chrysler vehicles for the school in September. The money will go towards the school's math program. Students were also treated to their choice of cookies or cake.